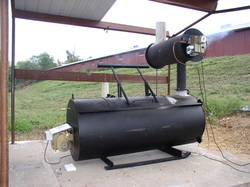 Poultry Producers: Example of an incinerator that a producer installed at a broiler farm. This incinerator was sized for the operation by our NRCS Technician Alan McGhee. The producer participated in our EQIP program. Individuals & other entities engaged in livestock and/or crop production are eligible to participate in EQIP. Eligible land includes cropland, pasture, private non-industrial forest land, and other farm/ranch lands. In Arkansas, EQIP is specifically designed to address the resource concerns of water quality issues related to animal manure management & sediment; improved management of irrigation water and reduction in ground water use; reduction of erosion; and improvement of wildlife habitat. All applications will be evaluated for funding based on a state developed procedure to optimize environmental benefits. Applications ranking highest in a funding category will be funded subject to availablity. Our office accepts applications year around.